As part of the launch of Volvo’s V60 Hybrid Electric Diesel model, a futuristic solar charging station is being developed that will be folded up and ready to deploy right from the car’s trunk. This solar pavilion is the first of its kind and is expected to be displayed as part of the car’s launch in Rome this coming fall. The design of the pavilion came from Synthesis Design & Architecture Designs and was the winner of the 2013 Switch to Pure Volvo Pavilion Design competition. The pavilion focuses on a green energy power source but does not lose site of the aesthetic and functional qualities of design. This experimental pavilion, while an intriguing creation, is not quite market-ready. If it turns out to be a functional and efficient product, it could serve to demonstrate another possible iteration of methods to provide some of the power to electric cars. 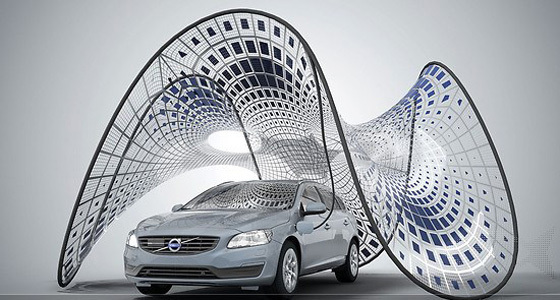 The pavilion, commissioned by Volvo Car Italia, is a collaborative effort between Synthesis Design + Architecture, Buro Happold, and Fabric Images, and will be launched in September 2013 in Rome, Italy.